Maybe when visiting Sainsbury’s Ladbroke Grove you have wondered about this building alongside the canal? “N.K.C.T” NORTH KENSINGTON CANALSIDE TRUST. When I moved to Barlby Gardens (April, 1981) there were three areas of derelict land to the north of our properties namely Old Oak Railway Sidings, the Western Gas Works, and Kensal Green Cemetery. As a result there were problems with “undesirables” creating a nuisance through unregulated activities with all the associated antisocial behaviour ranging from fly-tipping, fighting and begging, to mugging and burglary. Prosecuting and evicting trespassers plus clearing out the car breakers took unaffordable time and money: only for the need to arise again almost straight away. The problem was not only on land but on the water so involving British Waterways as well. Their mandate was to make the canal system self -financing. They needed to promote tourism. Barlby Gardens Residents’ Association was born to take action. We consequently met up with other likeminded, local groups including environmentalists, local politicians and some active aquatic sport enthusiasts, then formed The North Kensington Canalside Trust. Meantime Friends of Kensal Green had become active; British Rail, by whatever name it was then known, had declared an intention to have some future use for their shunting yards, and interest in Westminster’s section of the towpath was growing. The shunting yards were eventually redeveloped as the North Pole Terminus for the Channel Tunnel while the towpath saw significant improvements alongside Meanwhile Gardens. At our early meetings we each had bright, that is, ambitious and unrealistic ideas for the Gas Works’ site because there were two docks as well as eleven acres of surrounding land in toto. Furthermore, twenty to thirty years ago, the waterways of the country looked as though they would quickly become burgeoning playgrounds for “messing about in boats”. These docks were ideally suited to provide support services such as refueling, chandlery, provisioning and refreshment, once moorings proliferated along the towpath to fulfill popular demand for boating. For many people personal wealth, in terms of disposable income was concerned, and leisure time had increased and looked as though it would continue so to do. There was also an increasing number of people with time and money to spend. Furthermore we were concerned about the lack of “things to do” expressed by local young people. The aimlessness of unemployed youth, especially school drop-outs was problematical despite the fact that many had great potentialities where sport could harness some interest and enthusiasm. Hence we looked for a project that was expected to create work for some unemployed residents building new facilities for the community to enjoy and protect. Such care would arise because of their ownership of something they had helped to create and by providing enjoyable activities that would fully utilise the Western Gas Works site as an inland watersports facility. Sometime around 1980 the Gas Works Company gave the small basin to the Local Authority, I believe as a “development gain”. It was passed on to the ILEA (Inner London Education Authority) and there was talk of a canoe club being set up there. There were very good examples of what could be done within other local authorities along the canals in north London. The expanse of water on this site provided an unusual opportunity. Unfortunately education funding began to be severely curtailed prior to the demise of the ILEA. 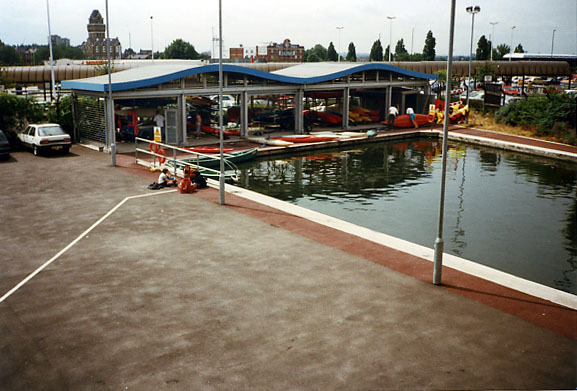 In 1987 the London Residuary Body returned the basin to the council, RBK&C. They too had severe financial constraints because of loss of the Business Rate with the fiasco over replacing “Rates” with a Poll Tax and in turn, the introduction of Council Tax. Some years on, we as NKCT were invited by RBK&C officers to become partners in the Watersports Activities’ Centre Project. Whereas on the one hand we had to sacrifice our independence we could benefit from the professional expertise and administrative power of their permanent staff. This conflict was sorely tested several times in ensuing years, initially when the appointment of contractors had to go out to tender since our own designs were not accepted and we lost one of our number, himself an architect, who had made a great contribution to the cause. Also we had to abandon our ideas of sailing because the project would be centered upon the small basin only, which would be much too tiny for sail although we did cling onto the idea of rowing along with canoeing. On the other hand RBK&C did have control of this dock and had not, so far, been in a position to proceed. Furthermore the Council were keen to act as “Project Manager”. Once we had reached agreement Kensington Housing Trust then came on board, being interested in developing flats, perhaps two dozen on three floors, in the airspace above the Activity Centre. Such accommodation would share wonderful panoramic views. Kensington Housing Trust (KHT) was prepared to “lease the air space” above the Centre to build a number of flats designed specifically for people with disabilities. They were prepared to pay over a quarter million pounds if agreement could be reached. As an up-front deposit this made all the difference to funding where matched funding came into play. 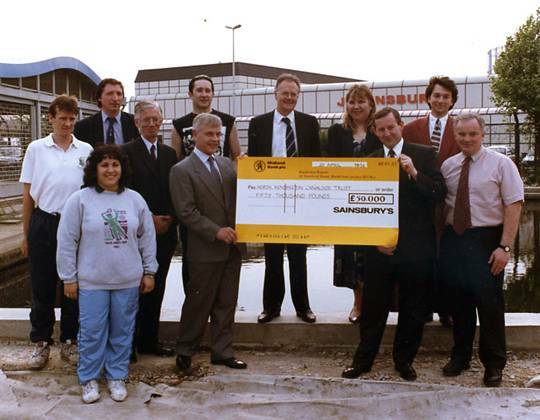 Meantime J. Sainsbury had begun operations to provide a superstore on an adjacent part of the site but between the two docks. This left very little room around the water for much by way of activity. More space was essential for movement and storage of boats, equipment and participants’ mobility. As the supermarket construction reached completion a request for help gave us leases on two small plots of land. These triangles made our site very much more convenient. 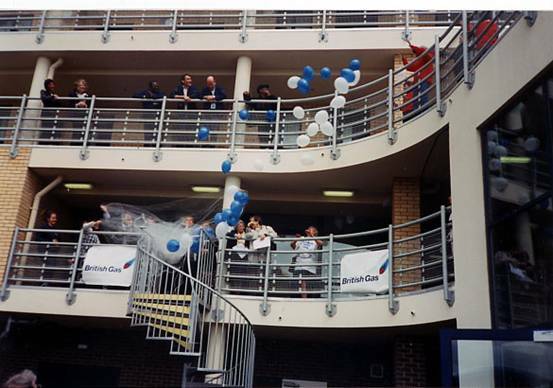 When the store opened they donated money and permission for limited parking in their car park because the only available parking space we had had been allocated to the residents. Negotiations with British Gas defined the narrow margin of banking surrounding the dock that could be considered ours. However, tests revealed just how poisonous the soil had become through the coking processes. Further, the water and silt were just as lethal. Derelict Land Grant of about a quarter million pounds was secured to clear the ground of, more or less, anything that could be objectionable, and fence it against further invasion from car breakers or anyone else. I think the next tranche of money came through the Urban Regeneration Fund. This was a similar sum, which enabled the site to be decontaminated. Foundations, underground oil tanks and pipelines, toxic soil, with much unwanted vegetation and debris, all was removed. The dock itself had to be dammed from the canal so that it could be drained, cleaned of several feet of silt, not to mention the accumulated submerged junk, and repaired. Fish and other aquatic fauna were saved by being returned to the canal. They floundered in the mud and so were caught easily. Successful grant applications seemed dependent upon an initial pot of gold. Running costs would be high – tens of thousands each year. Targeted audience needed to be subsidized for any activity not aimed at a self-financing clientele. The first problem was convincing any individual or organization that anyone else would help; matched funding was becoming the name of the game. Our personal contributions and events could hardly be recognized as of pump priming proportions. The towpath is on a higher level to that of the dockside because of the bridge taking the towpath over the entrance to the dock. 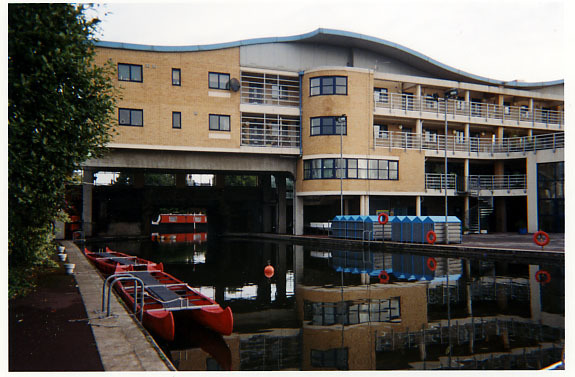 Whereas the first planning application proposed 22 flats on 3 floors surmounting a basement and ground floor water sports facility plans were eventually approved allowing for a structure restricted to three stories overlooking the towpath but four floors on the dockside. Sixteen fully accessible flats would occupy two and a half floors, with the Activities’ Centre having half the floor which gave access to the towpath plus all that could be used at ground (or water) level; apart that is from what was needed to provide sufficient number of suitable parking spaces for residents’ “mobility” cars. The flats were designed for people with physical disabilities being totally independent of the Activities Centre. This caused a restriction to be imposed curtailing the hours we could operate, namely nine till nine – just twelve hours. 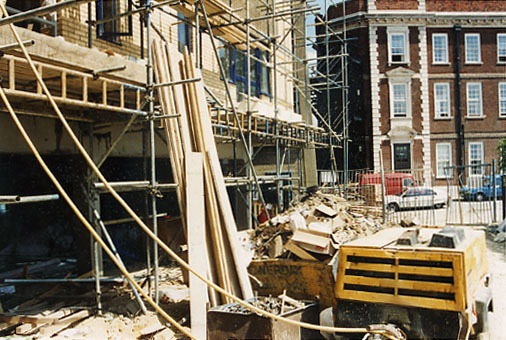 Construction began in 1994 and completed during 1996 by which time the Trust felt able to employ a Manager but on a one-year contract only because revenue funding was far from secure. The Job description was stringent as it included responsibility for fund-raising, good qualifications, and relevant experience. Having just a single employee rendered it impossible to operate all day every day let alone long days to include evening sessions, even though it was out of school hours, after school, weekends and holidays, where there was nothing to do. Much would depend upon the new Manager, the inaugural Open Day, and Volunteers. These were youngsters with water sports experience who were willing and able to pass on their skills and knowledge to others while aiming for further qualifications and enjoying themselves. Many such youngsters would be personal contacts of the Manager whilst others should be recruited locally. The opening was dependent upon borrowed equipment and the full cooperation of Meanwhile Gardens Canoe setup moving in. They had agreed in principal to transferring their operations over to our venue for a trial period with a view to making it their home base. Quite naturally with that equipment also came the fully-fledged team of volunteers complete with their home grown instructors most of whom were ready to work with the new setup in our fine custom built premises. Between September and March a great deal of paperwork was done, including grant applications and publicity. Schools, local V.I.P.s, and national Celebrities, were invited for the Grand Opening Ceremony in the form of a Free Trial Open Day for families and school parties, provided parental consent forms were completed beforehand. The weather was very kind so we had a fine day of fun. Colville Primary School Steel Band played, and Duncan Goodhew, Michael Aspel, and Robert Powell, launched the events speaking from the rescue boat in the middle of the dock. Sport England came up with a substantial grant for equipment which enabled us to buy much of what was still needed to obtain our certificate of excellence from British Canoe Union, as well as registering for rowing, trampolining, and outdoor activities. At this stage it seemed not only that the Centre desperately needed a second in command but that we could afford to have a Deputy or Assistant Manager especially as a suitable candidate was in the offing. Things went well from the beginning as far as activities were concerned. Many school children and people with severe disabilities were able to experience water sports for the first time. Some of them returning for training after school or on Saturday mornings with their families. However towards the end of that first season it became clear that even with two full time staff, weekends were not going to see the Centre open except for Saturday mornings for just two hours for the family session. Even with them working well together for the summer, it was possible neither to operate throughout the weekend, the long summer evenings, nor yet, remain open when a team was off site, away on an excercise or at a competition. What is more not enough recruits were coming in and those that were were not sufficiently representative enough of minority groups to warrant public money. Our funding applications were not being considered favourably. Cashflow was critical. The Deputy Manager became our second Manager but we were unable to appoint her replacement, she worked without a deputy as we struggled to remain solvent. It was another successful year in terms of the clientele, their individual and team performance, but not in either productivity or economics. There were never enough participants to enable funding applications to succeed. Another problem occurred when maternity leave for the manager became due necessitating another managerial replacement, without the financial situation looking any more secure. Once again the right candidate arose from a recruitment drive handicapped by little prospect of security of tenure. Amongst the Manager’s contacts were a number of volunteers with a wide range of qualifications and backgrounds. Some were already on the road back to full-time education simply because of the guidance incidentally given to them by their instructors whom they trusted, even admired. In turn they openly talked about education. They understood that it went hand in hand with their sporting achievements. In just three years one student came from leaving school without the O levels needed for college entrance to obtaining what she wanted, entry into Loughborough College. Two more also went to Bicton College on short full-time courses, returning with enhanced qualifications. The idea that school non-attendance can be corrected came about because the Pupil Referral Unit was canvassed and responded by bringing some of their charges to see what was on offer. Whilst no particular skills were needed in any basic training effort and risk seemed to appeal to them, the instructors obviously enjoyed what they were doing and the children had fun, wanting more. Some of our Volunteers knew exactly where they were coming from because they had been there too. Each of our three Managers brought qualities that enabled the Centre to grow and to deliver unexpected successes very early on. They had vision, ambition, and ability. Their combined efforts allowed children disaffected with school to follow a structure of training and testing without protest or falter thus growing in self-esteem and reliance as they “played”. They in fact worked with diligence, industry, and commitment. Likewise too the Managers were able to gain further experience and qualification leading teams in competitions and outdoor expeditions. By continually targeting schools, offering whole packages suitable for a single day of mixed activities and short courses in the form of six weeks of either two, or two by two hour sessions, a very wide range of pupils were shown what could be done in their free time. Because the main objective was to make opportunities available in out of school hours after school, half-term and main holidays were when training sessions, competitions and expeditions were organised. Not that everyone had to be competitive but children of all sorts turned up displaying very varied abilities and talents and what is more, they all mixed very well. Enough participants were high flyers who instinctively chatted about all sorts of things, mostly of what everyone was achieving. After all they were passing on a lot more than their physical skills but in addition they were inculcating a positive attitude to learning. They overtly helped those less capable with literacy and numeracy. There was a great deal of pride in everything anybody did well. Common sense seemed to prevail as well. There was a joyous ethos around the Centre. Irrespective of the fact that from any prospective sponsor’s point of view the head count was not high enough to warrant funding there was quite a high proportion of participants with a disability, either learning or physical. 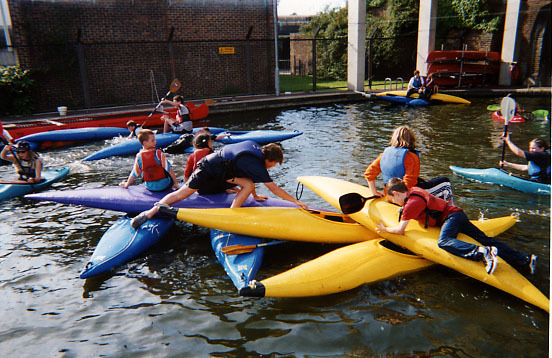 This meant that once the CanAC had been recognized as a Centre of Excellence it became obvious that some of the “volunteers” were capable of training up as instructors, putting the Centre in the unique position of being the only fully accessible water sports facility training instructors, who themselves had overcome disability. They were good role models for others. We had our share of problems since we were not immune from crime. Thousands of pounds worth of rescue launch went up in flames in an arson attack and the boathouse was broken into several times. Though the Manager took ultimate responsibility for security, everybody had to take responsibility for health and safety, rejecting foul language drugs abuse or petty theft but fostering mutual respect, and pride in the Boathouse, as it became known. Before the beginning of the fifth season it became obvious that funding was not going to match the expenditure through to the end of the Summer Holiday Programme. The Trustees had to serve notice to the Manager that without sufficient fund raising, activities would have to cease, and there was little chance of her salary being paid beyond the middle of the year. There was a great deal of disappointment in not being able to continue. However the Council, RBK&C, was not prepared to let the Activity Centre close and financed us until that September with the proviso that they assumed responsibility hence forward with their Sports Development Team. To avoid “trading whilst insolvent” we gave notice that NKCT would cease to operate after August 2000, and filed with Somerset House to be “struck off”. However CanAC has continued to function, and long may it so do. North Kensington Canalside Trust has helped to create and establish a water-sports activity centre adjacent to the Paddington Branch of the Grand Union Canal even though the Company itself has passed into history. This entry was posted in Canal, Uncategorized and tagged Gas Works, Kensington Housing Trust, Sainsbury's, sport, watersport. Bookmark the permalink.